“Of course, I worry about the future of Thang-ga, but I will try my best to protect and preserve the traditional techniques. I already feel happy if one of my ten students can inherit the painting skills,” Luobu Sida, a leading Tang-ga painter and teacher in Tibet, told China Daily during an exclusive interview on September 11, 2009. Thang-ga is scroll painting usually mounted on colorful satins and fabrics. Developed in the 7th century, this unique style of painting is made by folk handicraftsmen and holds a sacred place in Tibetans' hearts. Thang-ga is found in palaces, temples, and folk houses. In terms of content, Thang-ga features all aspects of Tibetan people's lives, such as religion, history, culture, art, science and technology. The Thang-ga painting has several schools, and Luobu Sida’s family has a history of making Mian’sa style Thang-ga for four generations. At the age of 10, Luobu started to learn from his grandfather and later learned from other leading painters, including Gaqin Luosang Pingcuo. From 1989, he was invited to participate in a number of construction and renovation projects, such as paintings for the coffin tower of the 10thPanchan Lama, and paintings for Drepung Monastery, one of the "great three" Gelukpa monasteries of Tibet. 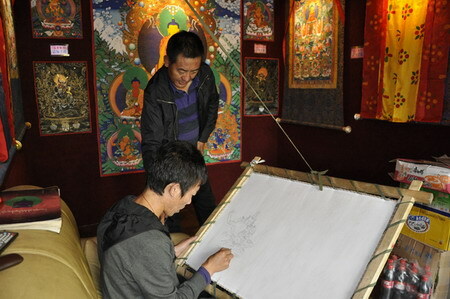 Since 2005, Luobu Sida started to copy the murals in the hall where the mandala of the Wheel of Time is placed in thePotalaPalace. Mandalas are pictorial representations of the Buddhist universe, and this mandala contains 200,000 pearls, coral, turquoise and gold thread, making it one of the most beautiful works of Buddhist art. In the hall, there are a total of 40 square meters of valuable paintings covering the walls, which were made during the 18thcentury and vividly depict the Buddhist stories. Some parts of the paintings have cracks or broken materials due to a long history and natural erosion. The paintings are first divided into parts according to scenarios. Then one part after another, Luobu copies the paintings on Tang-ga of the same size to keep alive those treasures and prepare for future protection. For the authenticity and integrity, Luobu has to use the magnifier to recognize the smallest details and then carefully draws one stroke after another. In some cases, he had to refer to historical Buddhist documents to recreate lost traces and capture exquisite movements and impressions found in the original paintings. At the beginning, Luobu worked everyday here and quickly found his body couldn’t endure the labor. “To focus on thehairlike strokes for hours and then hold my breath to draw on the Tang-ga is painful for my neck and shoulder,” Luobu said. Later he changed to work three days a week, on Monday, Wednesday and Friday. Five years have passed, and Luobu expects that he will finish the copying inPotalaPalacein 2010, a job which fills him with pride.